Preparing for a big day. Very interesting to watch it being created. Is it for a marriage? Looks like chocolate & you could lick it off! I saw this being done several times on television but not live like you did. It is an interesting practice to me. 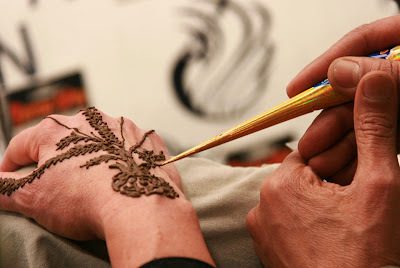 cool,, here in the PH,, you will most likely see henna tattoo-ing in the beach,, summer time! Lovely. I love the lines of the hands and the focal point of the brush. The Henna tattoos are so beautiful. I saw a lady working on the checkout in Tesco with henna'd hands. I agree with /t. It does look like embroidery! I got one in Camden and it was an awesome celtic-looking butterfly on my neck. Unfortunately, it didn't last one day. I was so sad. Such a gorgeous photograph of the artist's hands, Mo. I do like seeing people doing things. That thumb is so absolutely clear. I had that done once. It is amazing how delicate and intricate it is. great shot. I love how you've captured the application! I've only seen mehndi after it's dry and been rinsed off. I've only seen the art, not the craft. Lovely! I've never seen it being done and it's so cool. it does look like icing being piped on.